Design a curriculum around your passion for horses as you plan for a career in the equine sciences. Our coursework prepares you to work in the equine industry or for graduate or professional school. Deepen your understanding through science-based study in areas such as animal nutrition, equine reproduction techniques, and animal anatomy and physiology. With a uniquely flexible program in a field so diverse, our equine science graduates gain knowledge and skills leading to work in veterinary medicine, animal production, agribusiness, research, and more. Come ride with us! As a student, you ride, care for, and work directly with horses or compete as an athlete on one of our successful equestrian teams. Interested in becoming a Veterinarian? UMN Crookston pre-veterinary program has a placement rate for veterinary school that is nearly four times the national average. High School Students - Join us for Equine Science Exploration Days held each spring and fall where you can experience the classes and labs designed for an equine science major. At UMC we balance the practical skills students need through experiential learning and apply the theories required to build a successful career. Graduates of the Equine Science program understand and are able to meet the daily nutrition, health care, and exercise/training needs of horses in their care. Our Equine Pre-Veterinary Emphasis option gives graduates the large animal hands-on experience that is beneficial when seeking acceptance to a veterinary college or an advanced degree. We boast a high acceptance rate into these programs! Students work directly with the 45 horses residing in the stables. - Students train, ride, groom, breed, show, and care for these horses in order to gain hands-on experience with a wide range of breeds. - Students are not assigned to one horse in particular (unless they are in the training and showing class) but rather work with and ride a variety of the horses. Discover your interests in a broad-base curriculum that allows you to follow your passion in the equine industry with classes taught by award winning faculty. Our graduates have the knowledge and skills necessary to succeed in equine-related employment and have the business and management experience necessary in the field. UMC offers many leadership opportunities in equine-related clubs for all students including the Rodeo Association, Pre-Veterinary Club, and Horseman’s Association. Would you like to donate a horse, equipment or other supplies to the Equine Science Program? Learn more about donating! Equine Science graduates are able to pursue careers in a wide range of equine-related fields, as well as going on to a veterinary college or graduate school. Listed below are some of the careers where past graduates are working. Jayde Proffitt isn’t a competitive person, that is, until she finds herself in the arena competing for the Golden Eagles as a member of the Western Equestrian team. From Winsted, Minn., Proffitt grew up in town and enjoyed trail riding with friends but never owned a horse of her own. That fact hasn’t stopped her from pursuing a degree in equine science at the University of Minnesota Crookston. Learn more. Working as a veterinary technician intern at one of the most prestigious equine medical facilities in the country was the perfect setting for University of Minnesota Crookston senior Katie Warner to gain valuable skills and witness the latest techniques in the care of horses and foals. The Hagyard Equine Medical Institute in Lexington, Kentucky, was home to Warner from January to July where she worked with thoroughbred mares and their foals during breeding season. Learn more. During the summer of 2017, Selena Young, a junior majoring in Equine Science (with an pre-vet emphasis) from Plymouth, Minn., spent three weeks in Thailand helping animals, discovering Thai culture, and learning what it’s like to be a veterinarian. Traveling with study-abroad organization Loop Abroad, Young was selected as part of a small team that volunteered giving care at a dog shelter. She also spent a week working directly with rescued elephants at an elephant sanctuary. Learn more. One might describe Amberly (Pesall) Cox, an equine farm animal attendant and barn manager at the University of Minnesota Crookston, as something of a horse whisperer extraordinaire. Cox graduated from the U of M Crookston in December 2015 with a degree in agricultural business and a minor in equine science. Learn more. Would you like to donate or lease a horse or other equipment and supplies to the Equine Science Program? There are many benefits! Donation has many benefits for income taxes. The knowledge that you are providing quality horses or supplies for the training of future professionals in the equine industry. Horses donated to the University of Minnesota Crookston are excepted to have the ability to go right into UMC’s lesson program. Lessons are conducted 5 days a week with each horse being used 3-5 times per week on average. UMC does not accept horses with intention of selling them, however, if we feel the horse cannot meet the demands of our program, the horse may be sold or donated to an approved home with the donor having the first buy back option. If you are interested in donating your horse please complete the Prospective Horse Donation Application form. This form may be printed and mailed or you may include it as an attachment via email. If it is possible, please include photos and/or videos of your horse as well. This will help us to determine if your horse is suitable for our program at this time. Thank you for considering the University of Minnesota Crookston as a possible new home for your horse! Thank you for considering the generous gift of your horse to UMC. Someone from the program will contact you regarding the application. Please visit our Summer Camps & Conferences website for more information and registration details. The University of Minnesota Crookston fields equestrian teams in both Western and Hunt Seat Equitation. Many students majoring in Equine Science are part of these teams, although it is not required to be a part of either team. It's quite common for our equestrians to make it to Intercollegiate Horse Show Association (IHSA) Regional Championships and beyond. In 2018, members of our Hunt Seat Equestrian Team made their first-ever appearance at the National Collegiate Equestrian Association (NCEA) National Championship in Waco, Texas. Learn more about our teams via the links below. Did you know a degree from the University of Minnesota is recognized all over the world? True story. 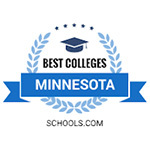 As a system campus of the University of Minnesota system, the U of M Crookston offers access to world-class teaching, learning, and research resources—all in a smaller, more personal campus setting that’s very much like a private school. The University of Minnesota is internationally recognized and respected by not only intellectuals and academic movers and shakers, but major employers who want to hire the best and brightest—namely, you. At the U of M Crookston, you won’t spend all your time behind a desk. Our curriculum is designed around experiential learning, which means we want you to have as much hands-on learning as possible. Depending on your major, you’ll find opportunities to be in the field, the lab, the classroom, or engaging in simulated scenarios that give you a competitive edge when you enter the workforce or head to grad school. You’ll learn the concepts and then actively apply them through projects, field trips, site visits, internships, and interactions with professionals in the field. Our faculty and staff members are respected not only for their knowledge and skills, but also because they care about you as an individual. They serve as true mentors, offering personalized attention through small class sizes, a student-faculty ratio of 18:1, and by working closely with you as advisors. They take the time to welcome you to the UMC community, watch you grow as a leader and scholar, and help you connect with alumni and other experts. At the U of M Crookston, we offer every student a laptop computer from day one. Everyone is tech-savvy, wi-fi is everywhere and learning happens in many ways, including simulations, applications and video presentations. It’s a virtual tech-topia! So, when you graduate, you’ll have all the latest technology skills, giving you a competitive edge. Employers consistently report the UMC graduates they hire are their “go to” people for technology and are well prepared for the demands of today’s technological workplace. More than 87% of U of M Crookston graduates gain full-time employment in their field or enroll in graduate or professional school within one year of graduation. That’s a fact. We’ll sure miss you when you graduate, but we know as a proud Golden Eagle alum, you’ll want to come back to cheer us on at homecoming or catch up with your favorite professors. Internships. They’re a great way to earn college credit, add to your resume and help answer the question, “is this really what I want to do?” You can find internship opportunities with everyone from the business down the street to Fortune 500 companies. Or maybe grad school is in your future. U of M Crookston students get the educational requirements and resources they need to apply to an array of graduate programs from veterinary science to med school to an MBA program. Many go on for more education in a variety of other fields. Opportunities for undergraduate research also add real value to your educational experience by allowing you to design and conduct research while working alongside faculty mentors. Research experience is especially helpful if you plan to attend graduate school. Whether you live in Minnesota, just across the border, across the country, or on the other side of the ocean, you pay the same tuition rate, and the U of M Crookston’s tuition rate is a real value because it’s the lowest of the five campuses that make up the U of M system. Additionally, with merit-based scholarships guaranteed based on GPA and ACT scores and more than 300 specialty scholarships, we really do help make college affordable. In athletics, Golden Eagles shake things up on the court, the field, and on the sidelines. The U of M Crookston competes at the NCAA Division II level in the Northern Sun Intercollegiate Conference (NSIC) as well as the Intercollegiate Horse Show Association (IHSA) and offers a full range of men’s and women’s athletic programs. The world really is a small place, and at U of M Crookston we value diversity. Our students bring rich experiences spanning six continents, and more than 20 countries and 40 states! We value diversity because it not only helps you better understand the world, it helps you understand yourself and how your piece fits into the puzzle of global society. Get involved in the many multicultural and international programs on campus, and you’ll see how easy it is to make friends from across the world. Or choose one of our international programs. Study, intern, volunteer, play, explore – here or anywhere. Take your pick from more than 300 options in 67 countries. Don’t just learn it, live it.